The vehemence of the demand is specific to the hideous weight of the painting’s subject, but it also represents the sticky logical conclusion of current discursive trends. The nature of this controversy — hinging predominantly on the identity of the artist, who is white, and who used one of the most triggering images in American history as her subject — indicates a full swing away from 20th century critical mind frame of “death of the author.” That view certainly had its questionable aspects, but so does seeing author identity as the sole dictator of the validity of their work. The painting of Till, meanwhile, was deemed, in Artnet News’ review of the biennial, “a powerful painterly reaction to the infamous 1955 funeral photograph of a disfigured Emmett Till… mak[ing] material the deep cuts and lacerations portrayed in the original photo by means of cardboard relief.” The New York Magazine review of the exhibit said, in regards to the rendering of Till, “see [the] thick, sluicing “Open Casket,” based on a portrait of slain teenage civil-rights martyr Emmett Till and see if the idea of Black Lives Mattering doesn’t crash in on you.” On the whole, both paintings were noted frequently in early reviews pointing out the potency of the Biennial’s political tone. The painting of Castile was made by Henry Taylor, a black man and thus someone — insofar as experience is presumed by societal categories — whose identity parallels that of the victim. The painting of Till was made by Schutz, a white woman. Again, as far as experience is generalized by societal categories, Schutz’s identity parallels not that of her subject, but of the woman who knowingly made a false claim that Till flirted with her, a claim that led to the 14-year-old’s brutal murder. The artist’s racial identity is also that which dominates the American art world, and of course, the country around it. Once the whiteness of the artist became the lens through which the painting was viewed, what was seen formerly — by white critics — as politicized depth became rampant artistic violence; interpretations of its anti-racist politicization and relevance to the Black Lives Matter movement shifted in the discourse to capitalization on black death, even after the artist declared that the painting would never be for sale. The subject matter is not Schutz’s; white free speech and white creative freedom have been founded on the constraint of others, and are not natural rights… In brief: the painting should not be acceptable to anyone who cares or pretends to care about Black people because it is not acceptable for a white person to transmute Black suffering into profit and fun, though the practice has been normalized for a long time. 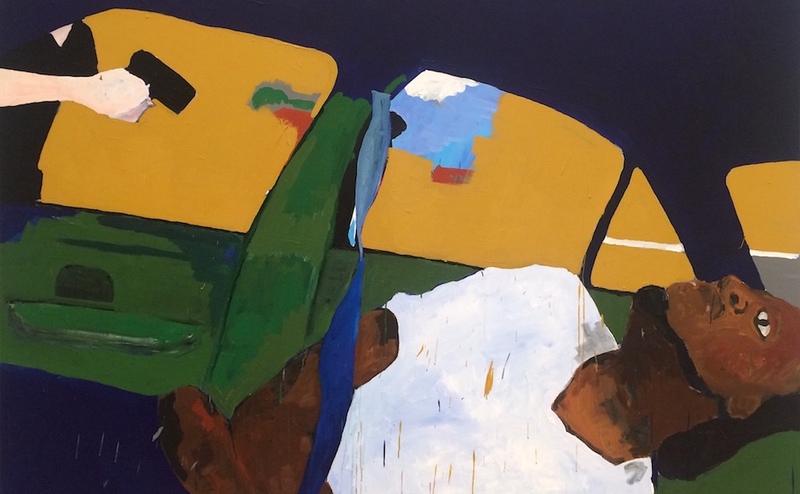 The petition — and physical protests — contributed a needed complication to the theretofore largely white analysis of Dana Schutz’s painting. Too often, art about oppressed minorities becomes acceptable only when that art makes a spectacle of oppression. This extends beyond racial oppression — before gay people, for example, were allowed to exist nonchalantly onscreen, they could only exist within narratives where they were brutalized or marginalized. Movies about trans lives typically star cis actors enacting their own notions of trans people’s mistreatment by society. And black Americans — whose history is wrapped up in the most severe forms of oppression — from slavery and disenfranchisement, to mass incarceration and police brutality — have seen decades of art, film, and TV (particularly that made and accepted by white people) focused on black suffering, with little in the way of black joy accepted into the mainstream to counterbalance it. Real black suffering, by contrast, has been continually ignored. The Internet has been immense as a force of awakening for seeing and understanding how black people are still treated in America, particularly by the police — but nobody seemed to believe what black people had been saying for decades until there was graphic video evidence shared across social media confirming their claims. Videos of black death have unequivocally been a mobilizing tool — but that doesn’t mean that it doesn’t say something nauseating about white Americans that that’s what was needed to make people care. The photo of Emmett Till’s open casket funeral shoved the horrors of racism into the faces of complacent white America — and in 2017, we find ourselves looking at the damages of continued complacency, and of injustice rendered so long invisible by it that now the reaction to that injustice is to make it hyper-visible, often to the point of spectacle. Regardless of what you think of Schutz’s painting, the idea of bringing awareness to this overarching trend through protest like Parker Bright’s adds to the discourse surrounding the trend. The protests and criticism demonstrate art’s potential for continued, varied conversation. Analyzing the painting (and, for that matter, art like the Castile painting as well) without at least acknowledging the context of American society’s spectacle-making of black death would be ignorant; and if black people are particularly being vocal about what this kind of art does, those opinions should be heard with more weight than that of white critics. But the “remove and destroy” rhetoric of Hannah Black’s letter also dismisses the idea of the potential for heightening discourse. Coming from a group of artists, this element — alongside the suggestion that this art cannot exist as anything other than “profit and fun” — is worrisome. But imagine if this became the common demand for protestations of art that’s deemed offensive. (We don’t have to imagine, of course — conservatives have been doing this for years, sometimes carrying out their threats.) The idea of destroying art that could spark such a panoply of interpretation and conversation seems counter to the idea of art’s existence. What purpose does art have — at least art in an age where beauty isn’t its qualitative determinant — if it’s not to demand that people have uncomfortable conversations? This is a time in American history when finally cultural institutions are starting to give a voice to people other than the white, the straight, the (etc.). This means that there’s also now a bounty of perspectives being shared. The true nature of the experience as impacted by society’s visions of identity is finally beginning to be represented (which is why, when people complain about PC culture, it often sounds like the issue for them, really, is just with any kind of voice that doesn’t correlate with their comforts.) But a time so rife with potential for vast subjectivity and debate is not the time to start precedents for destroying or even “removing” art that offends. (Unless it is actually intentionally racist or an incitement to violence, the latter of which particularly merits a very different conversation). It’s not a bad thing that literally everything will offend someone who can then share that offense online — it’s an indication that now it’s not only a collective white voice that’s being heard. But it would be dangerous if the burgeoning trend in “artistic offense = reason for silencing” became the norm, because then art and discussion could fall into deep, paralytic safeness, with a logical extreme conclusion of total absence. Again, any piece of art is almost inevitably going to offend to someone. Flirting with censorship as a protest demand in this political moment seems dangerous. It risks normalizing censorship at a time when the power to censor — outside the Biennial — rests firmly in the hands of the most extreme right-wing administration we’ve ever seen in our lifetimes. If an institution or group on the Left did actually (very) hypothetically fulfill demands for the destruction of some piece of art, the fuel for the Right to silence voices to bigoted ends — as has so often been the case — would be all the more replenished. There’s also the Right’s current fondness for using “censorship” as a dog whistle to their most extreme supporters — Leftist silencing and/or destruction of controversial art would allow for arguments that the Left is overly fond of censorship next time some fucker like Milo Yiannopoulos comes to speak on a campus. I made this painting in August of 2016 after a summer that felt like a state of emergency—there were constant mass shootings, racist rallies filled with hate speech, and an escalating number of camera-phone videos of innocent black men being shot by police. The photograph of Emmett Till felt analogous to the time: what was hidden was now revealed. The painting is very different from the photograph. I could never render the photograph ethically or emotionally. I always had issues with making this painting, everything about it. And it is still uncertain for me…The anger surrounding this painting is real and I understand that. It’s a problematic painting and I knew that getting into it. I do think that it is better to try to engage something extremely uncomfortable, maybe impossible, and fail, than to not respond at all. Ultimately, beyond “should a work of art be destroyed” (it shouldn’t, and won’t be) the protest boils down to a question of whether someone should attempt to tell a story that is not their own, and especially a story as grotesquely tragic and racialized as that of the murder of Emmett Till. The answer of the protest, at least, is a firm “no.” Hannah Black’s petition dichotomizes people “who care or pretend to care about Black people” and people who might find this painting for any reason potent, or even not worthy of destruction. In particular, where we’re talking about art that deals in horror, tragedy, and injustice, there is an inherently strange relationship between the viewer and their laudatory ideas about the art, and the actual subject itself. Consuming, and then reviewing, the structuring of someone else’s pain is one of the more ethically ambiguous elements of spectatorship, across the board. In a capitalist and white supremacist society, where the art object is inherently commoditized for privileged audiences (though this particular piece, again, is not for sale), there’s even more of an ethical concern when it comes to the visualization of black suffering, even if it’s to purportedly anti-racist ends. But should that murkiness completely overwhelm art’s ability to not just trouble the borders of experience, but also to reposition experience in dialogue with politics, media and visual culture? Clearly, the identity of the artist — the power and/or privilege it gives them, the experience it predisposes them to, the place it naturally positions them as a critic — should be considered. The identity of the subject is important — whose story is the artist telling? What qualifies them to do so? And what do they stand to gain from it? Nevertheless, there’s a certain rigidity in these discussions. If we accept that artists should wholly refrain from reaching beyond the calcifying symbolic value of their own identity, we risk a potentially very harmful stratification along identity lines.